It has since posted dozens of temporary jobs on its website to recruit staff during the liquidation process. Its 30,000-person workforce in the US is expected to lose their jobs. Toys R Us is hiring. The iconic toy store announced that it would be liquidating all 735 of its stores in the US and Puerto Rico just a week ago. 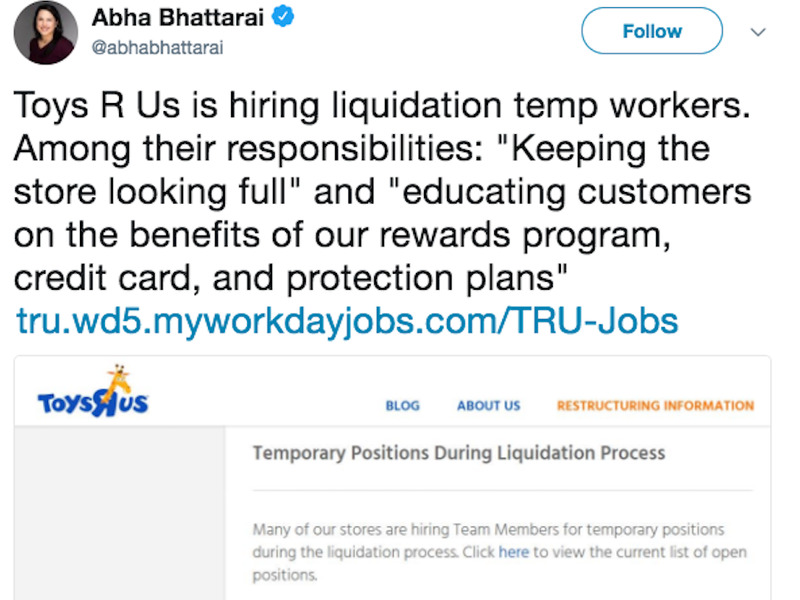 Now, it has posted dozens of temporary jobs on its website to recruit staff to work in stores during its liquidation process. On Wednesday, five new postings were added. They were looking for sales assistants and a cashier across the Toys R Us and Babies R Us stores. 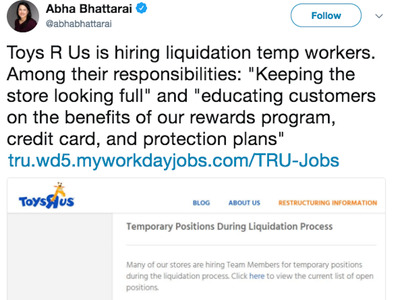 Toys R Us did not immediately respond to Business Insider’s request for comment or confirm how these new employees would be paid. The job description does not specify how long the contract is for. In the dozens of job profiles that we checked, all were advertised as part-time. The closure of the two chains threatens to put 30,000 jobs in the US at risk, according to Reuters. A further 3,000 people could lose their jobs in the UK. Its closure has also created big issues for vendors who are kept in limbo, not knowing whether they will be paid for merchandise stuck on ships and trucks. Some of the smaller vendors are likely to go bankrupt because of this, experts say.